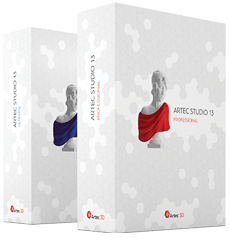 Artec Studio is an industry-acclaimed software package for advanced 3D scanning and data processing. It enables you to scan countless objects using Artec scanners as well as third-party 3D sensors (Artec Studio Ultimate only). This manual will show you how to use the application as well as your 3D scanner to quickly and easily create great-looking 3D models. Use the left panel to get an overview of the entire manual, or refer to the Quick Start Guide. To get the most out of the documentation, review the various terms we use throughout. Consult the Index to find references for specific parameters that appear in processing algorithms. Also, take a look at the Conventions and Acronyms section for a key that describes how we highlight semantic elements. The incomplete list of chapters below is intended to clarify the document structure. 3D Scanning at a Glance (Quick Start Guide) is a brief overview of scanning and processing basics. It also covers Autopilot mode. Scanning explains the basic principles of object scanning and offers advice on how to conduct the scanning process to obtain the best results. Viewing Scans and Models describes ways in which to control an object’s appearance in the 3D View window and obtain the best view of the 3D model. Project Operations contains information on data management, working with projects, exporting and importing data, undoing recent operations, and saving the history of project changes. Data Processing focuses on data-processing techniques: working with separate scans, alignment, fusion, filters, defect-elimination methods and texturing. Additional Modes demonstrates how to publish models on the Web; how to use additional features, such as employing several scanners to capture an object; and how to use measuring tools. In addition to this manual, you can find practical tips and other information at the Support Center. If you encounter an issue when using our 3D scanners or applications, please submit a request. Download a PDF version of this manual. Documentation for earlier versions of the software is available here. Important information appears in specially formated paragraphs. Characters that appear in a field, file extension, or directory or file path employ the following style: Scan 1, SPROJ, C:\Program Files, and so on. © Copyright 2019, Artec 3D.